City in the Prussian government district of Coblenz. On April 19, 1283, twenty-six Jews were murdered there, among them the boy Hezekiah, whose father, Jacob, had been killed at Lorch in 1276. In 1287 the Bacharach Jews were subjected to persecutions caused by the murder of Werner, who was made a martyr of the Church. 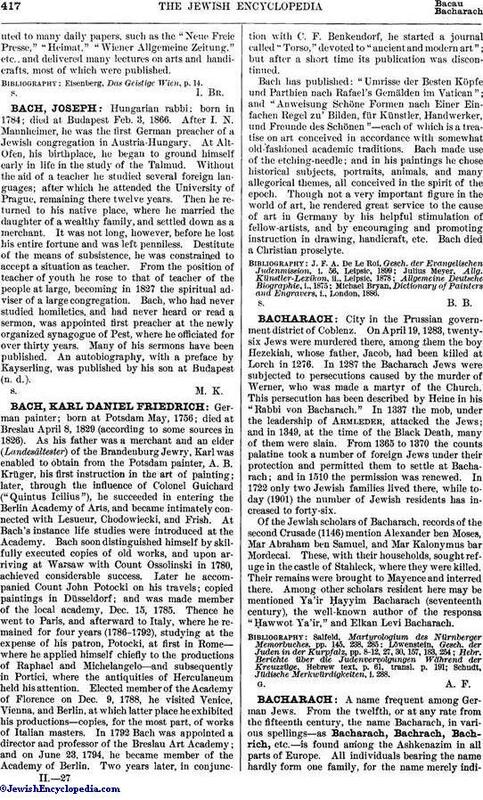 This persecution has been described by Heine in his "Rabbi von Bacharach." In 1337 the mob, under the leadership of Armleder, attacked the Jews; and in 1349, at the time of the Black Death, many of them were slain. From 1365 to 1370 the counts palatine took a number of foreign Jews under their protection and permitted them to settle at Bacharach; and in 1510 the permission was renewed. In 1722 only two Jewish families lived there, while today (1901) the number of Jewish residents has increased to forty-six. Of the Jewish scholars of Bacharach, records of the second Crusade (1146) mention Alexander ben Moses, Mar Abraham ben Samuel, and Mar Kalonymus bar Mordecai. These, with their households, sought refuge in the castle of Stahleck, where they were killed. Their remains were brought to Mayence and interred there. Among other scholars resident here may be mentioned Ya'ir Ḥayyim Bacharach (seventeenth century), the well-known author of the responsa "Ḥawwot Ya'ir," and Elkan Levi Bacharach. Schudt, Jüdische Merkwürdigkeiten, i. 288.